Peptide (C)DLVNMHSRVDQLD, corresponding to amino acid residues 190-202 of human nAChRα4 (Accession P43681). Extracellular, N-terminus. Homology Rat, mouse - 12/13 amino acid residues identical. Reconstitution 25 µl, 50 μl or 0.2 ml double distilled water (DDW), depending on the sample size. Preadsorption Control 1 μg peptide per 1 μg antibody. 1,2. Anti-Nicotinic Acetylcholine Receptor α4 (CHRNA4) (extracellular) Antibody (#ANC-004), (1:200). 3,4. Anti-Nicotinic Acetylcholine Receptor α4 (CHRNA4) (extracellular) Antibody, preincubated with the control peptide antigen. Immunohistochemical staining of immersion-fixed, free floating rat brain frozen sections using Anti-Nicotinic Acetylcholine Receptor α4 (CHRNA4) (extracellular) Antibody (#ANC-004), (1:200). A. Expression of nAChR α4 (green) was visualized in rat cerebellum. Purkinje cells were positive for nAChR α4 (arrows). B. The same section was stained for Parvalbumin (red) and counterstained (blue). Immunohistochemical staining of perfusion-fixed frozen mouse parietal cortex sections using Anti-Nicotinic Acetylcholine Receptor α4 (CHRNA4) (extracellular) Antibody (#ANC-004), (1:300) and Anti-Nicotinic Acetylcholine Receptor β2 (CHRNB2) (extracellular)-ATTO-594 Antibody (#ANC-012-AR), (1:60). A. nAChR α4 staining (green). B. Same section stained for nAChR β2 (red). 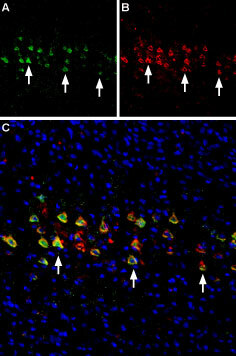 C. Merge of the two images reveals several cells expressing both receptors (arrows). Nuclei are stained with DAPI (blue). ___ Unstained cells + goat-anti-rabbit-Cy5. ___ Cells + Anti-Nicotinic Acetylcholine Receptor α4 (CHRNA4) (extracellular) Antibody (#ANC-004), (1:20) + goat-anti-rabbit-Cy5. The control antigen is not suitable for this application. Albuquerque, E.X. et al. (2009) Physiol. Rev. 89, 73. Karlin, A. et al. (1986) Ann. NY. Acad. Sci. 463, 53. Kalamida, D. et al. (2007) FEBS J. 274, 3799. Fu, X.W. et al. (2009) Am. J. Respir. Mol. Biol. 41, 93. De Rosa, M.J. et al. (2009) Life Sci. 85, 449. Blonde, A. et al. (2000) Psychopharmacology (Berlin) 149, 293. Wilens, T.E. et al. (1999) Am. J. Psychiatry 156, 1931. Tanner, C.M. et al. (2002) Neurology 58, 581. Schneider, J.S. et al. (1998) Ann. Neurol. 43, 311. Acetylcholine, released by cholinergic neurons, activates two groups of acetylcholine receptors (AChRs); muscarinic AChRs (mAChRs) which belong to the superfamily of G-protein coupled receptors (GPCRs) and nicotinic AChRs (nAChRs) which belong to the ligand-gated ion channel superfamily. nAChRs also respond to nicotine, hence their name1. These channel receptors are usually non-selective cation channels activated upon ligand binding which ultimately leads to the depolarization of postsynaptic cell membranes. To date, 17 different but related subunits of nAChRs have been identified and cloned. They consist of a subunits (α1-10), which is responsible for the binding of ligands. In fact, this subunit includes a Cys-loop in the first extracellular domain that is required for agonist binding2. The other subunits responsible for making up the active receptor are the β (β1-4), γ, δ and ε subunits3. Structurally, all subunits have the following: a conserved large extracellular N-terminal domain, 3 conserved transmembrane domains, a variable cytoplasmic loop and a fourth transmembrane domain with a short extracellular C-terminal domain. An active nAChR is generally a heteropentamer (homopentamers also exist) of these various subunits organized around a central pore1. All α subunits are expressed in neuronal cells except for the α1 subunit which is specifically expressed in skeletal muscle. They are also expressed in non-neuronal cells such as bronchial epithelial cells4, as well lymphocytes5. The diversity of these receptors and their functional organization gives rise to unique properties and functions. The α4β2 receptor composition makes up a high affinity nicotinic receptor. In fact, its upregulation (mainly expressed by the increase of functional receptors at the membrane and not expression per se) is responsible for the increased appearance of binding sites following nicotine administration1,3. Animal studies have shown that nAChR-related mechanisms are involved in attention function6. Indeed α4β2 nAChR seems to also be involved in attention-deficit hyperactivity disorder (ADHD), a disease distinguished by a lack of attention, distractibility and hyperactivity3. The α4β2 and α7 nAChRs appear to be critical in rats for attention and working memory. Also, a α4β2 specific agonist was shown to reduce impulsivity, hyperactivity and attention deficits in adults with ADHD7. This same receptor subtype may also be involved in Parkinson’s disease (PD) as smoking and α4β2 nAChR agonists show beneficial effects in PD8,9. Anti-Nicotinic Acetylcholine Receptor α4 (CHRNA4) (extracellular) Antibody (#ANC-004) is a highly specific antibody directed against an epitope of the human protein. The antibody can be used in western blot, immunohistochemistry, and indirect flow cytometry applications. The antibody recognizes an extracellular epitope and is thus ideal for detecting the receptor in living cells. It has been designed to recognize nAChRα4 from mouse, rat, and human samples. Ganic, E. et al. (2016) Cell Rep. 14, 1991. Kiss, T. et al. (2014) PLoS ONE 9, e109538.